I discounted Sampson Harbison as a possible relative for some time, on the theory no late 18th century Catholic Irishman could ever have been named Sampson. Yet he existed. I still don't understand the name, except there was a family named Sampson living near Cookstown, Co. Tyrone, in the late 18th century, presbyterians. Yet Sampson was certainly Catholic. 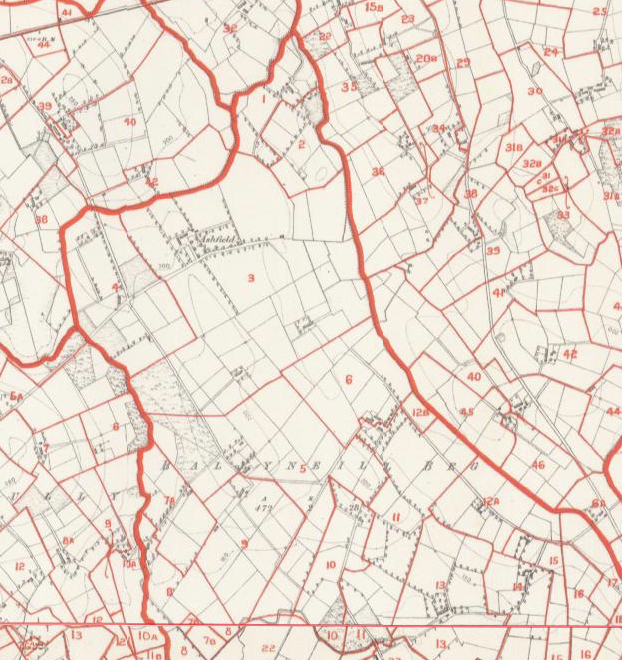 He appears first in a baptism record for Ballinderry, Co Londonderry, on April 19, 1829, father of a son James, wife Rose Donnolly, and with Mark Devlin and John Harbison as witnesses. 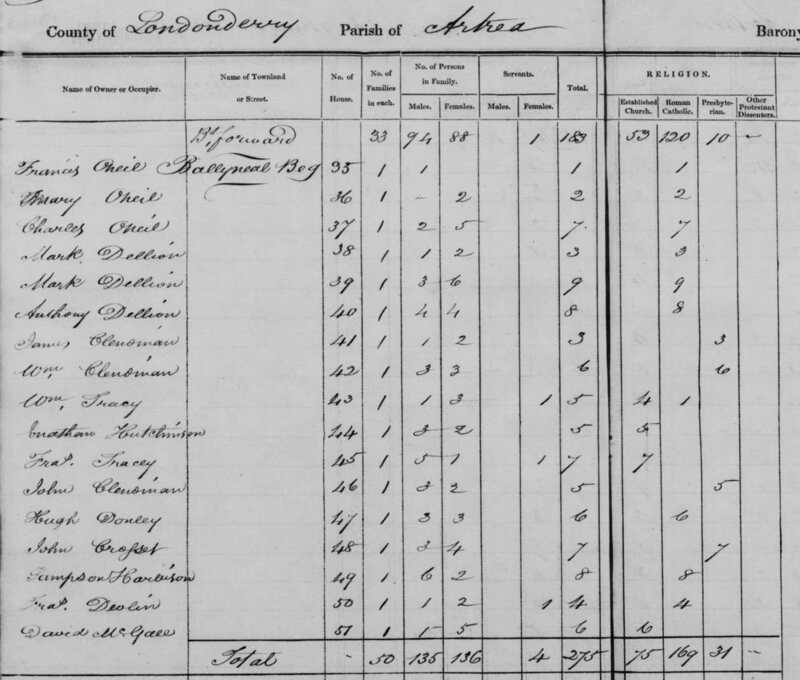 Because the 1831 census data for parts of Londonderry survived the Four Courts fire in Dublin in 1922, we have by good fortune a record of Sampson's family in 1831. It contained 6 males, and two females. One female may have been his wife Rose Donnelly; but since he married Sarah Devlin in Moneymore on September 23, 1832, Rose Donnelly might already have been dead. One male was clearly his son James. We have a christening for Ellen, daughter of Sampson and Sarah Devlin, on September 28, 1833; and for a daughter Mary on February 18 1839 (Eleanor Harbison and John Devlin were godparents). That is the last Irish record for Sampson. The next record is in the 1860 US Census for (surprise!) Woodbury Township, in Blair County (previously Hutchinson County) Pennsylvania. Sampson is listed as 78, which would put his birth in 1782. His wife Sarah is 55, which would put her birth in 1805, meaning she would have been 27 at the time of her marriage. It seems inevitable this is the same Sampson, not only because of the unusual name, but because of the clear geographical association with Henry.Sampson's death is listed in the town records of Philadelphia on April 23, 1866. Sarah may have died some years previously; in 1863, Sampson was living at 1346 Hancock Street, living with Mary Harbison, 'gentlewoman', possibly his daughter. 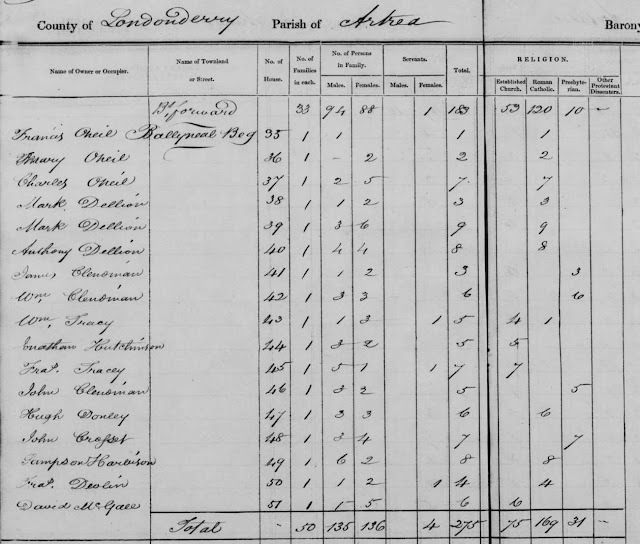 There is also a persuasive but not certain 1850 census record for a 'Samuel Harbinson' living in Kensington 3rd ward of Philadelphia, born in Ireland, and aged 60. wife Sarah, aged 47, and two children Ellen (14) and Charles (10). As we'll see, Charles also turned up in Woodbury; all four are listed as born in Ireland. So it appears Sampson emigrated between 1840 and 1850. I have not yet found passenger records for Sampson or his family, though I believe emigration was 1840 or soon thereafter. 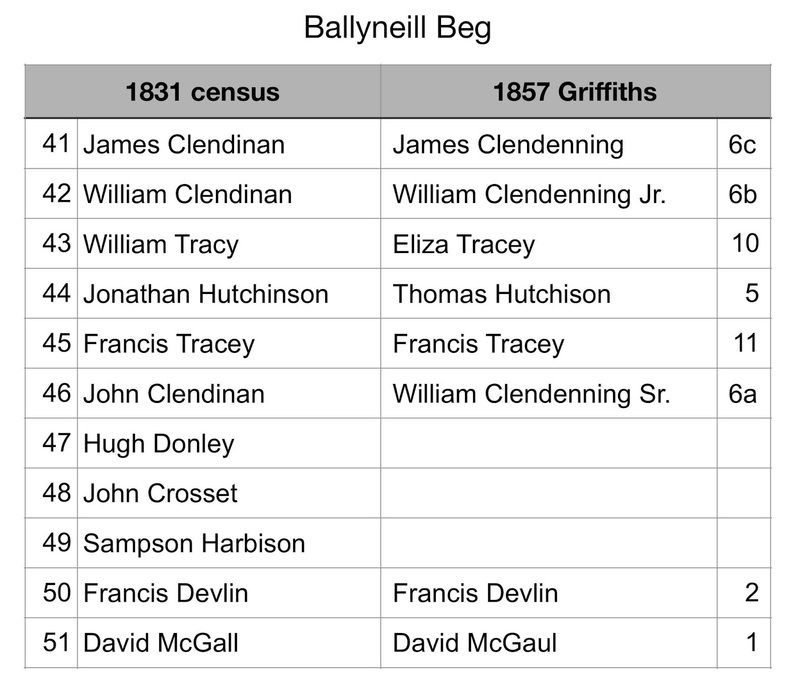 There is no trace of any of the family in the 1857 Griffith's valuation for Ballyneill Beg. We can however make some inferences about where they lived. While the house numbers in the 1831 census and in Griffith's valuation are not aligned, they are often correlated. 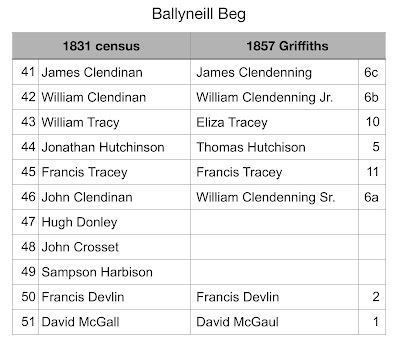 These are the data for the north end of Ballyneill Beg. 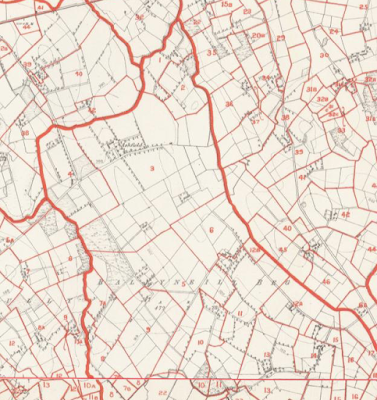 It looks like the 1831 census takers moved south to north, and Griffiths runs north to south. Harbison, Crosset, and Donley are gone. That makes it likely Sampson lived in Griffith's plots 3, 4, 7, 8 or 9, with 3 as the most likely. Here's the map.